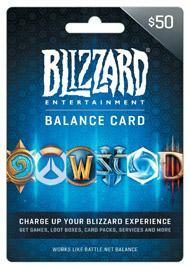 Contest: Win a $50 Battle.net Giftcard! Win a $50 Battle.net Giftcard! Prize: x1 "$50 Battle.net Giftcard" Giveaway! What you must do to enter: Several options for gaining entries. Statistics: This contest was opened by 119 and entered by 5 ContestChest.com members. 4% of those who opened the contest, entered it.